Rana organizes and guides cultural and art tours in Jordan. She is intimately acquainted with its rich history, diverse cultures and contemporary geography and dynamics. With a background in the arts and development, Rana offers unparalleled knowledge of, insight into and passion for both must-see sites and little known treasures around the cities of Jordan. Rana’s experience includes working as Country Director for the Jordan Parks Project/Partnership for Environmental and Cultural Tourism and as Cultural and Development Specialist with the American Embassy in Amman. Rana brings together the practical street smarts of an Amman native with the sensibilities of artist who has ‘seen’ her city through the media of photography, oil painting and mixed media. Trust her to navigate Amman’s traffic and maze of narrow streets, while she opens up a world of culture, art and history that goes beyond your guidebook, providing you with an experience of Amman that you will never forget. 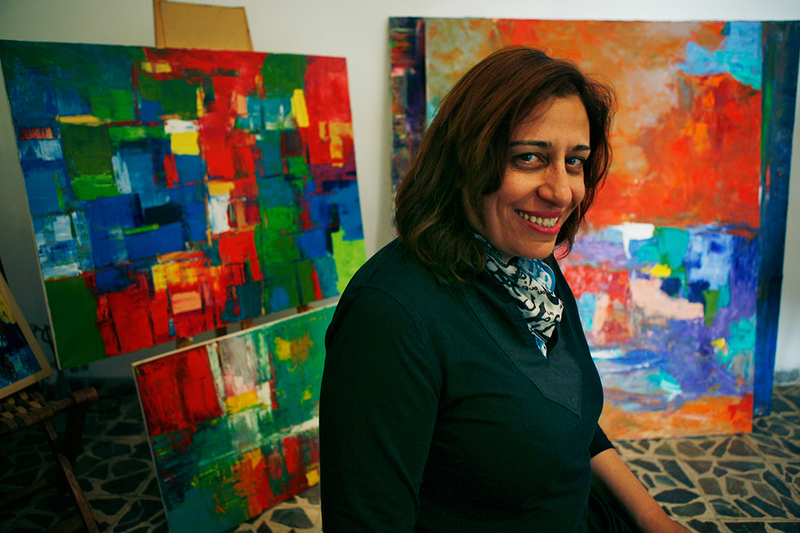 Rana A. Safadi is an artist of the mystical, the emotional and the spiritual. She was born in Amman; studied literature, arts and tourism in Jordan, Austria and France. During a regionally very well regarded career, Safadi’s work has travelled a trajectory of fine art investigations. Evolving and exploring, she first used photography as a medium before turning to oil paint and soon after, mixed media with oil. Sensitivity to delicate states of experience in her mature works is expressed by Safadi’s characteristic use of bold colour, the emblem of the strong feelings she has for her subjects, the strong emotions she wants to share with her viewers. She was raised in and is based in Amman and so much of what she does is inspired by, and a love letter to, the city and society she grew up in. Safadi works in a context of modern Arab artists creating in a plethora of mediums. She is a voice working along others in defining what the Arab “Modern” style is.